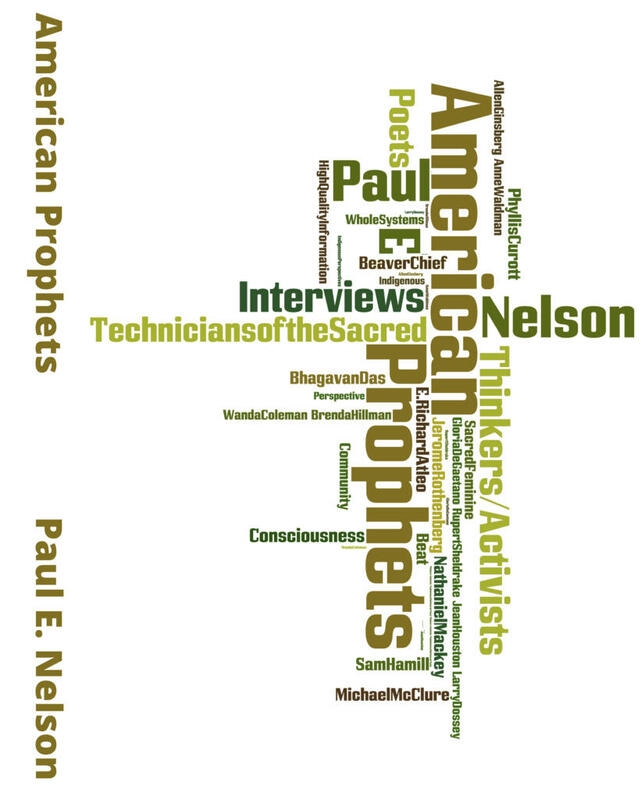 The launch of AmericanProphets, my book of transcribed interviews mostly taken from the years of the syndicated radio show I hosted and produced between 1993 and 2004, has been not only a cathartic event for me personally, but has also reconnected me to former guests who have received their contributor copies. It is an essay brimming with perceptions demonstrating how focused Dr. Dossey has been on the topic of human consciousness since that 2000 interview we did and years before that certainly. It is such a huge bit of validation regarding my antipathy toward the materialist haze we find ourselves in and in favor of the poetics to which I have been dedicated for the last twenty-five years that are also in opposition to the materialist paradigm. Materialism asserts that consciousness is somehow produced by the brain and is confined to the brain, the body, and the present. This view of consciousness has become so hegemonic that it is almost heretical in some circles to question it. However, this view of consciousness suffers from two severe defects: the sheer poverty of evidence that brains produce consciousness, and the enormous human costs of a world that is sanitized of a spiritual outlook, which the materialist dogma forbids. No human has ever seen a brain or anything else produce consciousness, and there is no accepted theory as to how this could happen. The link between a brain and consciousness is as mysterious today as it was when Thomas Henry Huxley wrote in 1886: “How it is that anything so remarkable as a state of consciousness comes about as a result of irritating nervous tissue, is just as unaccountable as the appearance of the djinn when Aladdin rubbed his lamp in the story.” … the materialist view of consciousness is empirically bankrupt. The poetics that seeks to connect with this global brain have been known as many different things: Projective Verse, Organic Poetry, The Practice of Outside, Impersonal Voice, the received poem &c. &c. When writing, when doing any kind of art, we can tap into sources much larger than ourselves. When one has had the experience of art that is created in this way, going back to that which is limited to the human ego is unsatisfying. The book American Prophets tracks my own exposure to many angles of this basic notion, especially through some of the best 20th and 21st century U.S. poets who helped develop theories of poetics that assume this stance-toward-poem-making as Olson described it in 1950. 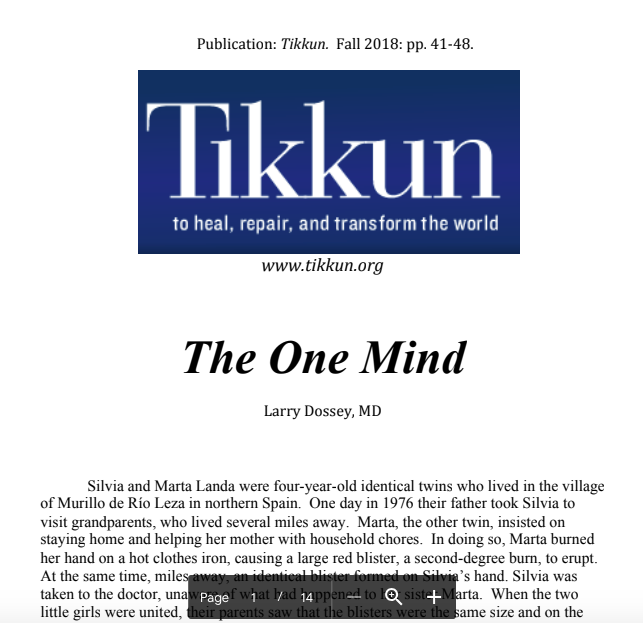 Purchase a copy of the latest print edition of Tikkun and see how artfully Dr Dossey weaves the different threads together to give us a way out of the materialist worldview that imperils the very biosphere that sustains us. This entry was posted in Uncategorized and tagged Charles Olson, Hegel, Larry Dossey, One Mind, Silvia and Marta Landa, Tikkun. Bookmark the permalink.